Tomb Raider's multiplayer mode is coming courtesy of Deus Ex: Human Revolution developer, Eidos Montreal. Last week, Official Xbox Magazine revealed that the upcoming Tomb Raider reboot is going to ship with a multiplayer mode. As is often the case when doggedly single player franchises suddenly gain multiplayer features, the reaction from the gaming community was mixed. While the multiplayer mode may leave its mark on Tomb Raider's budget, it won't divert effort away from the game's single player campaign, as they're being handled by two separate teams. In this case, the multiplayer component is being developed by Thief 4 and Deus Ex: Human Revolution developer, Eidos Montreal. The single player is being developed by Crystal Dynamics. Details about the recently announced multiplayer components are scarce, though a listing from UK retailer, GAME, seems to indicate that there may be more to it than a straight up deathmatch. "Survive as a Team: Play a variety of multiplayer modes as Lara's Shipmates or Yamatai's Scavengers," read the listing, which has since been removed. "Yamatai" is the island Lara finds herself stranded on in the single player campaign. 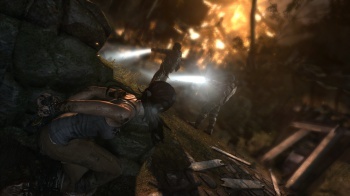 Tomb Raider will be the first game in the main Tomb Raider series to feature multiplayer. That being said, 2010's download-only spinoff, Lara Croft and the Guardian of Light, did feature an excellent co-op campaign. You can expect a more detailed look at Tomb Raider's multiplayer mode in the February Issue of OXM and at the Consumer Electronics Show, this month. Tomb Raider is due for release on PC, 360 and PS3 on March 5th.